Why is retaining employees so difficult? Well, times have changed. Gone are the days when companies held complete control and employees would remain with the same company for their entire career. We have entered the age of the employee where talent rises to the top, and job opportunities and technology give employees control over their career path more than ever. If an employee feels mistreated or not aligned with the company values, they jump ship without thinking twice. Why? Because they have options. Job openings, recruiters, and apps put new opportunities in the pockets of every employee. A younger workforce who is accustomed to mobility, specific values, and new experiences will not stay at an organization with a mediocre employee experience. As the US economy improves there is a higher demand for workers than over the past 10 years. 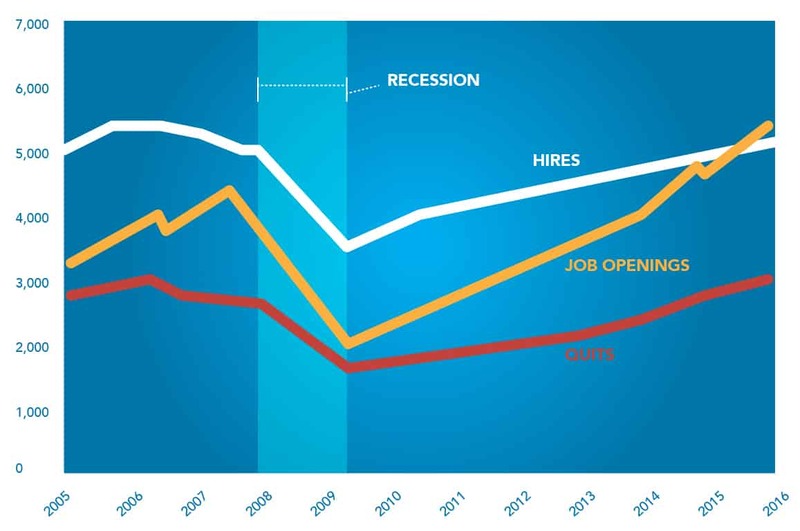 Since 2015, job openings surpassed hires, meaning that there are more jobs available than can be filled. Quits, or voluntary separations, and are rising accordingly as new and better opportunities become available. This is great for job seekers yet problematic for organizations looking to retain top talent. Why would people quit their jobs right? A valid question, especially for those of us that went through the 2008 recession. 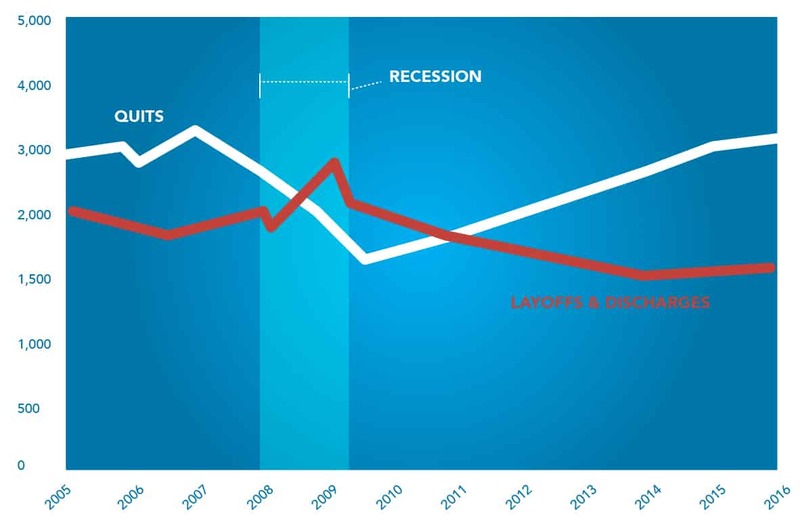 Quits plummeted during the recession as workers weathered the poor economy. This created a back-log of potential quits that were released as the economy improved. The recent decrease in layoffs is making employed job seekers more confident in their ability to find better work, thereby increasing quits. With all of the new job openings available, it seems average tenure would be declining. But the latest data from the US Department of Labor in 2014 shows average tenure is at its highest point over the past 30 years. Tenure is flat since 2012 and we suspect a slight decrease will be found once new data becomes available. 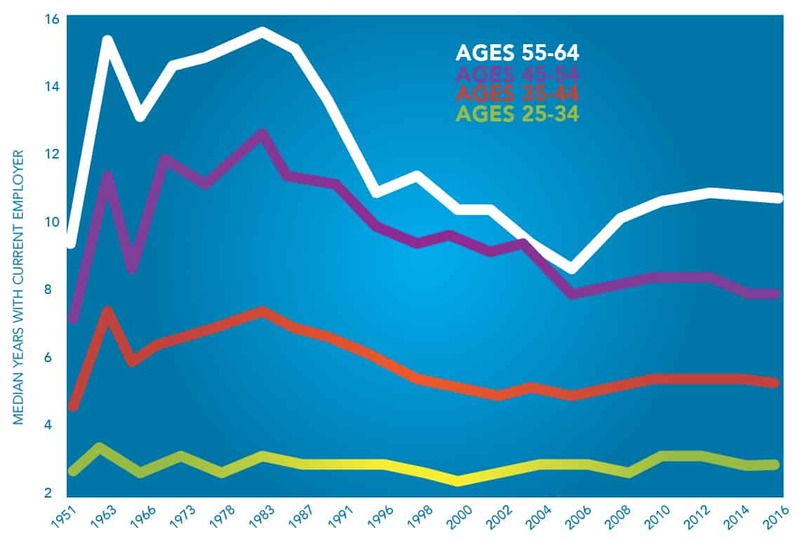 Looking at tenure by age shows that the youngest group of workers have the lowest average tenure of about three years. This hasn’t changed much since 1951. Think about it. Younger workers are usually more mobile and are looking for better career opportunities. 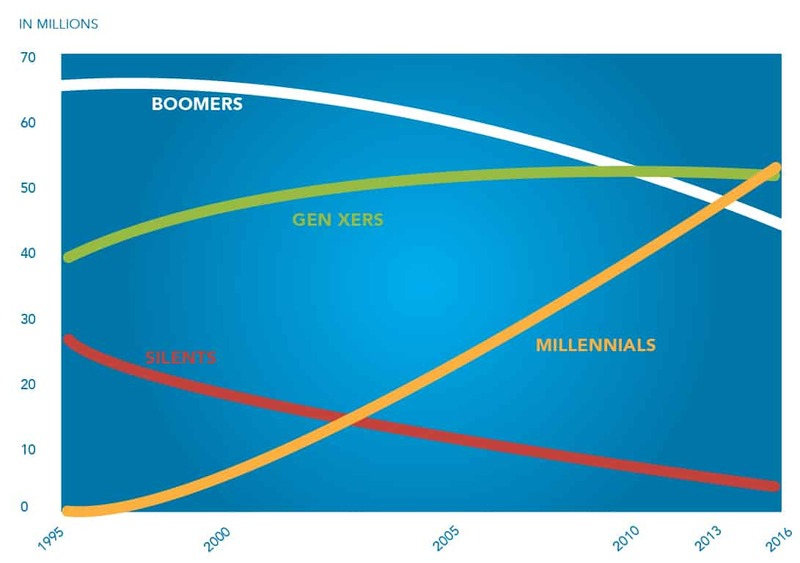 Millennials now make up the largest segment of the workforce. 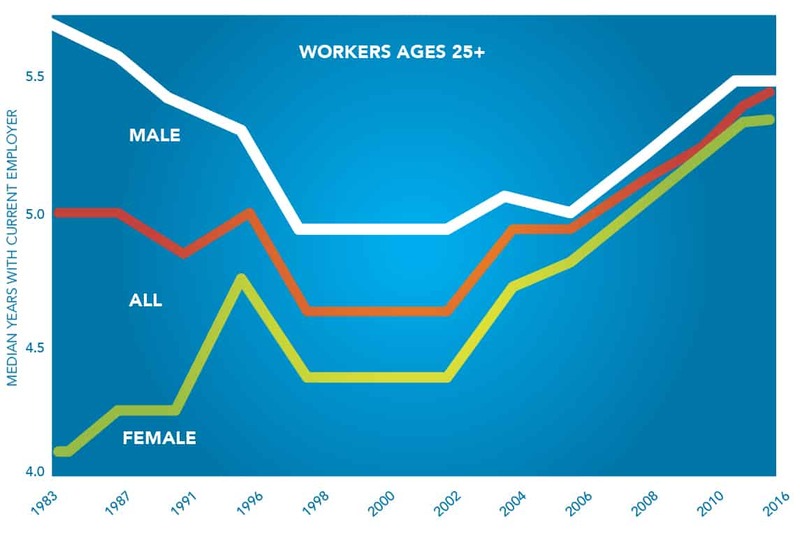 There is a lot of talk about Millennials, but the truth is that they are just as mobile as young workers in the past, there are just more of them in the workforce now. Brand (Attract New Talent): The expectations people have of the company as an employer. Why would someone want to work for your company? Transactional (Retain Your Best Workers): The formal expectations between an employer and employee of the employment contract. What makes employees stay at your company? Psychological (Engage Your Employees): The unwritten expectations that motivate and engage employees in their work. What engages employees to do their best work? How these contracts are fulfilled determines the strength of the employee experience and how well an organization attracts, retains, and engages its workforce. The Employee Experience helps organizations attract and retain top talent but also reveals the secrets for building a deeply engaged workforce. With deep insights into the dynamics of trust and mutual expectations, this book shows that before you can deliver a transcendent customer experience (CX), you must first build a superlative employee experience (EX). This is not about creating a worker’s utopia, and it does not mean that work must be easy; employees are responsible for managing expectations and meeting the organization’s requirements. Read more on Employee Turnover here.